Dudley Council staff and elected members. Together they shared their enthusiasm and excitement for the range of activities that could happen at Brierley Hill Civic, how the space could be made more welcoming, the arrangements for hospitality and how the community could be involved in the running and promotion of the venue in the longer term. We want to thank everyone that came and shared their ideas so generously. 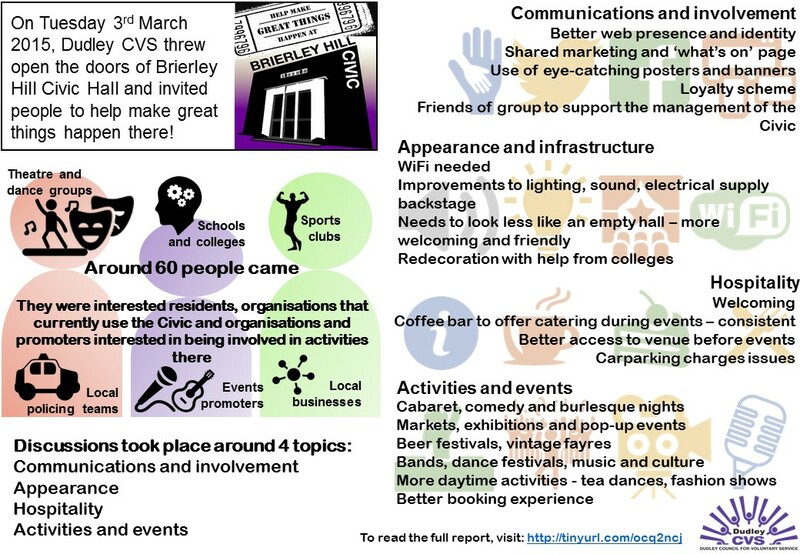 These ideas have now formed part of a report, which you can view by clicking this link: BHCH open event report. Alternatively, click on the picture above for a more visual summary! You are still very welcome to add your thoughts right here or use the #BrierleyHill hashtag on Twitter. Would be very disappointed as a feminist that burlesque nights would even be considered. Surely we have moved on from this. I think that we should always bear in mind equality and not see women as sexual objects. Thanks so much for getting involved in the ongoing conversation about how we can make Brierley Hill Civic a vibrant resource for the whole community and for all manner of events and activities. This report includes all of the suggestions and feedback we received both on the day and throughout the period of consultation. We wanted to make sure everyone’s views and ideas were represented. In terms of the reference to ‘burlesque’, I believe that the meaning behind it was around theatrical / variety type events involving both male and female artistic performers and welcoming both male and female audiences. I think you’ve raised a really important point in a wider debate about artistic expression, offence and (self)-censorship. It’s a really tricky balance to strike for a venue hiring out its space when something that’s seen as appropriate for some could be offensive to others, and that could involve a whole range of activities such as certain comedians, beer festivals, boxing, body-building etc. It’s a dialogue we’ve started with the local authority, our members and residents to help ensure the Civic is a thriving and safe space for everyone.